Summary: To Kill a Mockingbird may well be our national novel. It is the first adult novel that many of us remember reading, one book that millions of us have in common. It sells nearly a million copies a year, more than any other twentieth-century American classic. Harper Lee's first and only novel, published in July 1960, is a beloved classic and touchstone in American literary and social history. To mark the fiftieth anniversary of To Kill a Mockingbird, Mary McDonagh Murphy reviews its history and examines how the novel has left its mark on a broad range of novelists, historians, journalists, and artists. In compelling interviews, Anna Quindlen, Tom Brokaw, Oprah Winfrey, James Patterson, James McBride, Scott Turow, Wally Lamb, Andrew Young, Richard Russo, Adriana Trigiani, Rick Bragg, Jon Meacham, Allan Gurganus, Diane McWhorter, Lee Smith, Rosanne Cash, and others reflect on when they first read the novel, what it means to them—then and now—and how it has affected their lives and careers. 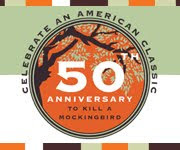 Scout, Atticus, and Boo: A Celebration of Fifty Years of "To Kill a Mockingbird" is a lively appreciation of the many ways in which the novel has made—and continues to make—a difference to generations of readers. Right on the heels of finishing TO KILL A MOCKINGBIRD, I decided to pick up SCOUT, ATTICUS & BOO by Mary McDonagh Murphy. I have been anxiously awaiting the publication of this book ever since I saw it previewed at BEA. I have to be honest...I just knew I was going to love it. You see, SCOUT, ATTICUS & BOO is basically one big lovefest for all things TKAM! SCOUT, ATTICUS & BOO explores how TKAM has impacted not only individuals, but our entire culture and society. The book is based on journalist Mary McDonagh Murphy's interviews with over twenty celebrities and authors about what TKAM means to them. The foreward of the book is written by Wally Lamb, one of my favorite authors; and I was hooked on this book from the first few pages. I admit that I didn't get my bottom off of the couch until I was done reading the entire book. SCOUT, ATTICUS & BOO touched my heart and reaffirmed why TKAM is my all-time favorite book! SCOUT, ATTICUS & BOO is divided into two sections -- a history of the book and characters and then the interviews. I definitely learned a lot about the book and the author which I really appreciated, but I think I most enjoyed reading about how TKAM affected other people. I thought the author did a wonderful job of interviewing a wide variety of individuals, and it was very interesting to "hear" Harper Lee's sister as well as the actress who played Scout in the movie. Naturally, some of the interviews resonated with me more than others -- namely, Wally Lamb's, Anna Quindlen's, Lizzie Skurnick's, and Adriana Trigiani's. Reading SCOUT, ATTICUS & BOO actually made me think a great deal about my impressions of TKAM. I was extremely grateful that I had just finished the novel so it was fresh in my mind. Of course, many of the interviewees reinforced my opinions of the book, but I was also surprised by how many of them brought up new (and very insightful) points about the story, the characters, and especially Harper Lee's writing. I enjoyed all of the interviews and I thought each one brought a very unique perspective to the novel! A TKAM lovefest sounds wonderful! I just finished this and really enjoyed it. There was such breadth among the various pieces. As someone who loves and will have to - no, get to! - teach TKAM, I'm thankful for this review! Glad to know that the book's best parts were how TKAM has impacted people. I'll add it to my wishlist!